WHETHER WEDDING, CORPORATE MEETING, NON-PROFIT GALA, OR AN INTIMATE SOCIAL DINNER, THERE IS A PERFECT OPTION FOR EVERY EVENT! 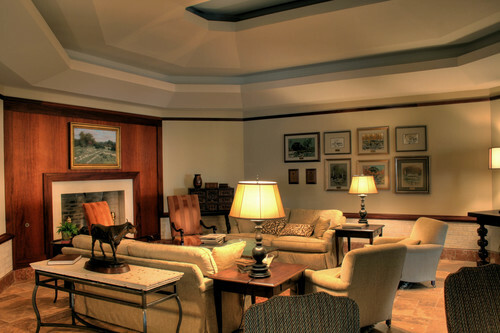 The original part of the Etter Alumni Center from the initial build-out in 1965, the Main Lounge & Concourses house authentic cowhide chairs, leather couches, marble coffee tables, rustic chandeliers, & a Lorenzo Ghiglieri bronzed buffalo statue to set the tone for the perfect reunion space on the University of Texas campus. 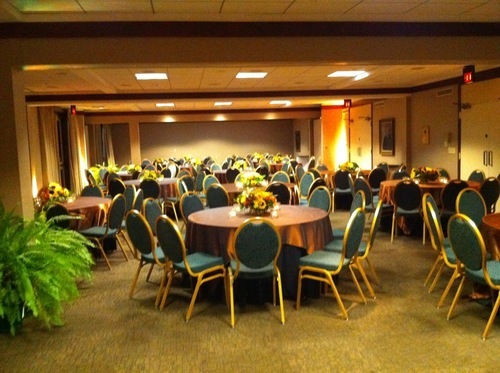 Together, the Main Lounge & long Concourse spaces allow for up to 300 people for a cocktail hour or reception gathering space. 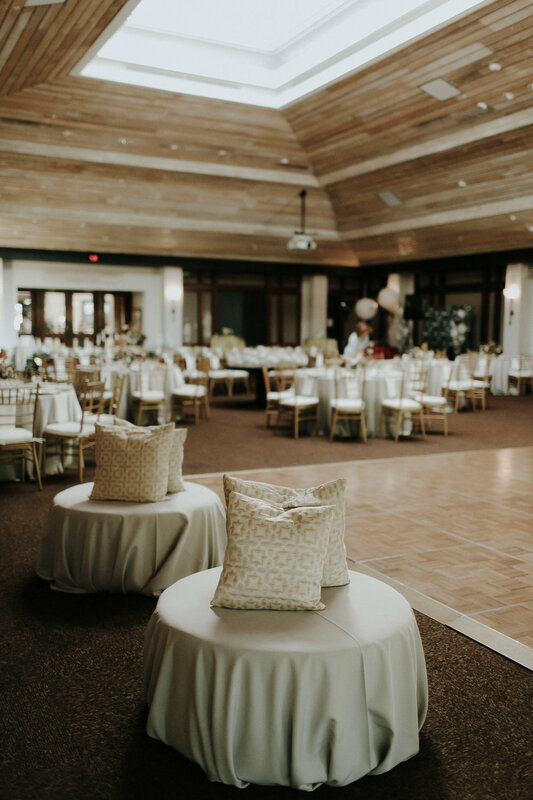 With lofted ceilings, weddings up to 150 guests are accommodated for full banquet seating on the Concourse, cocktail hour space in the Main Lounge, and existing dance floor space on the exquisite marble floors. Adjoining patios on both sides of the lounge allow for ceremony space, optional outdoor dancing, cocktail hour space, or overflow for larger receptions. This 5,600 square-foot ballroom with 270 degrees of floor-to-ceiling windows awash in natural light is perfect for large gatherings of 420 seated or reception-style for 600+. The majestic open skylight at the zenith of the ballroom allows for day-lit daytime meetings and dancing under the stars for evening weddings. Built-in projectors allow for presentations on hidden drop-down screens of corporate sponsorships or pictures of the celebrated couple. Two patio doors on the Ballroom lead to a wrap-around terrace with access to the natural amphitheater that overlooks the iconic Waller Creek. The picturesque backdrop for wedding ceremonies, the Regents Bridge is one of the oldest bridges on the University of Texas campus and also makes an ideal stretch for wedding guests to line-up for sparkler departures when the bride and groom make their final exit. The newest addition to the Etter-Harbin Alumni Center, the Legends Room & the Wofford Denius and Charmaine Denius McGill Foyer were extended north on the property in 2011 to create a mid-size banquet space holding up to 150 guests seated, or 200 reception-style. 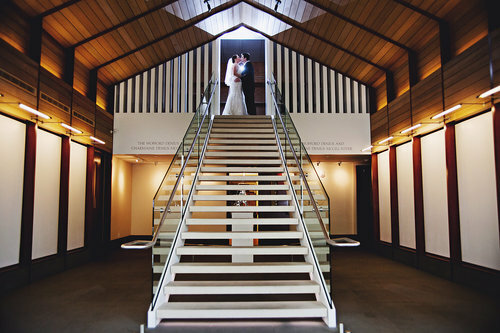 With the modern lines of the Atrium, this space is an obsession of photographers for matchless portraits, and provides cocktail or pre-reception space to the Legends Room. 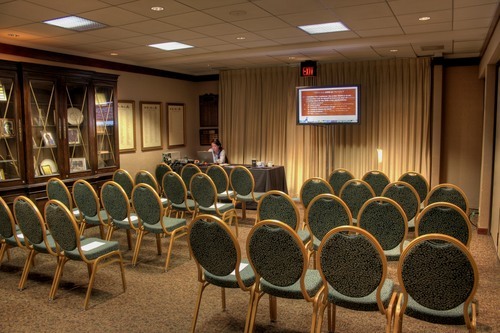 A unique L-shaped space, the Legends Room has windows that overlook the UT Darrell K Royal-Texas Memorial Stadium and is presented with six flat-screen televisions for easy viewing of corporate presentations or football & sporting events. 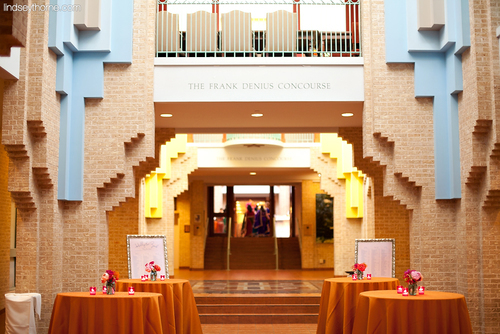 The room provides a tribute to the major donors and sponsors of the Texas Exes and is a consistent draw for those related to the University of Texas- whether graduates, department professors, or devotees. 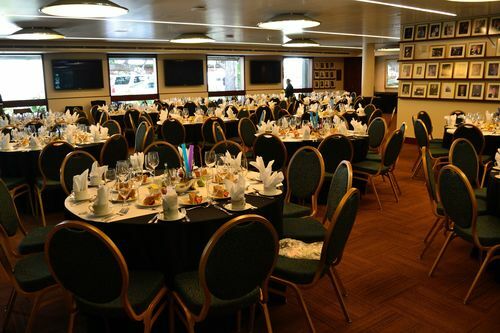 Positioned together in three interlocking rooms, these spaces can be separated by air walls for conference or event break-outs from 15 to 80 guests or utilized for small VIP receptions. Each space opens on to the West Terrace, shared with the Ballroom space for a unique opportunity of event flow & ease of use for guests. 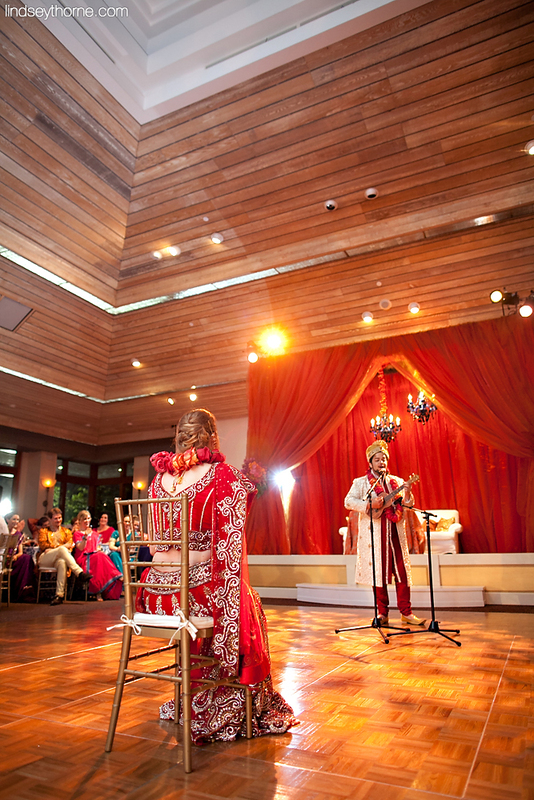 Also used for an outdoor wedding ceremony rain plan, these interconnected rooms seat up to 200 guests theater-style with views that bring the outside indoors. The John Jackson Room is complete with large wing-back leather chairs flanking a fireplace with chessboard table for the truly perfect groom’s ready room. 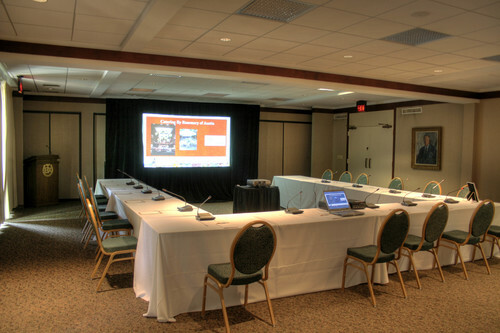 Also used for small break-outs of up to 20 guests, the room has one whiteboard and one large chalkboard built into opposite walls that stay neatly tucked behind wood facades. An architectural eye-catcher, the covered pavilion echoes the natural tones of the University of Texas campus while adding a modern flair that draws guests in from the sidewalk. Accommodating up to 200 guests seated for a ceremony facing either the natural back-drop along Waller Creek or the towering UT Stadium, this space is ideal for wedding ceremonies, outdoor cocktail receptions, or groups of 150 seated for a luncheon or dinner. Complete with misters & lighting, this space also offers the option of adding a plug-in sound system to the built-in speakers.